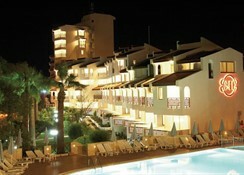 The Sentinus Beach, Kusadasi offers family friendly accommodation in an idyllic beach front setting. It has a wide variety of facilities and activities for guests to enjoy including on-site shops and a hair salon.Families are well catered for at the resort with a supervised kidsâ€™ club keeping younger visitors entertained with a fun-packed programme of activities, a playground and their own swimming pool. The animation team keep older residents amused with a variety of entertainments throughout the day and evening with shows and a disco taking over during the night. Active guests will appreciate the well-equipped fitness suite which has a selection of weights and machines catering for all abilities. The outdoor pool provides the perfect spot to relax and while away the hours on the comfortable sunbeds or head down to the white sandy private beach where a selection of motorised and non-motorised water sports can be enjoyed. There is mini golf and volleyball on-site as well. The hotel offers a great location on Kusadasi's famous Long Beach, overlooking the Aegean Sea and the Greek island of Samos. Public transport connections can be found in front of the hotel. The beach is also just a few metres away. The bus station is around 5.5 km away. Milas Airport is around 120 km away, while Adnan Menderes Airport is approximately 88 km away from the establishment. The air-conditioned, beachfront property was renovated in 2012 and consists of a main building and an annexe, comprising a total of 102 rooms. The hotel is suitable for couples and families. The rooms are decorated in muted tones and feature a balcony or terrace. The hotel offers a range of recreational facilities, including an outdoor swimming pool with a children's swimming area and a poolside snack bar. Guests can also relax in the sauna and steam room, or try their hand at a range of water sports. The Sentinus Beach, Kusadasi is the perfect choice for discerning couples and families who want luxurious surroundings with a private beach and plenty of activities to enjoy. The hotel boasts an impressive outdoor pool with separate childrenâ€™s swimming pool. Both have well-furnished terraces. 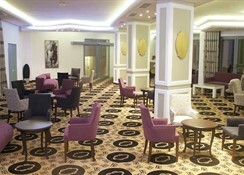 The hotel has 102 tastefully decorated guest rooms providing spacious accommodation. Facilities include an en-suite bathroom, air conditioning, safe, LCD TV, mini bar and balcony. The hotel has a buffet and two a la carte restaurants serving Turkish and International delicacies freshly prepared using locally sourced ingredients. 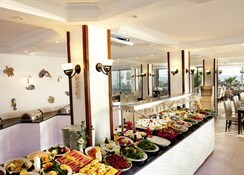 Lighter snacks and a range of beverages may be enjoyed from one of the five bars. 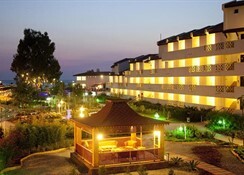 The hotel is conveniently located on a private beach on the outskirts of Kusadasi. 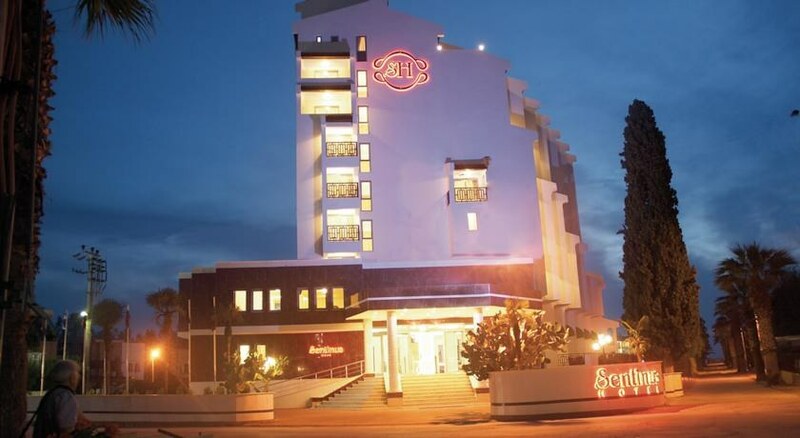 Guests have easy access to a number of local shops and restaurants as well as a bustling nightlife. good size room for 3 adults, hotel spotlessly clean, beautiful gardens, very limited all inclusive drinks, food always something to eat very good choice on salad bar not much choice for deserts, entertainment poor ,not all staff spoke english but you get by, good sandy beach at end of hotel with free sunbeds, for price paid a good holiday with lovely weather.